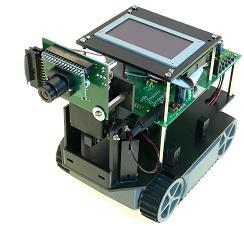 The POB-Bot Lite Pack is a complete robot assembling all the POB-Technology's know-how. It provides a mechanical base on which an intelligent color camera, a screen, and I/O management board are mounted. A CD-Rom with examples and development tools, a serial cable for your PC are also provided. Development in C, Java or Basic. The first robot totally open for user, as well for mechanical, electronics as software. You can use your robot with given examples or let your imagination go freely by developing new behaviors or adding electronics to increase capabilities and give new horizon to your robot. This kit is exactly the same as POB-8001 -- POB-Bot Golden Pack except the POB-Grip. More software, documents, and video clips are available.